In the vacinity of our neighborhood playground is a very neat bamboo forest, as the kids call it. It's pretty thick bamboo with a few paths that have been carved through it. 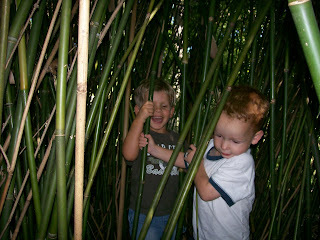 It's a great place for the kids to hide and play, and Dawson, Carson, and a few other kids had a really good time in this bamboo fort during our playgroup. 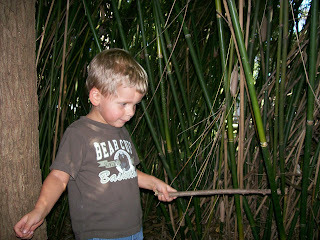 Dawson using a stick to chop the bamboo. 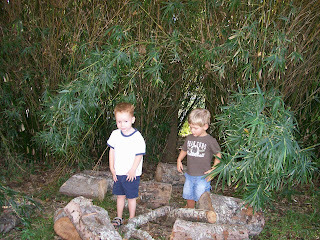 Carson and Dawson on the other side of the bamboo forest, where they discovered another fun play area - lots of logs from a giant tree that had been chopped down.